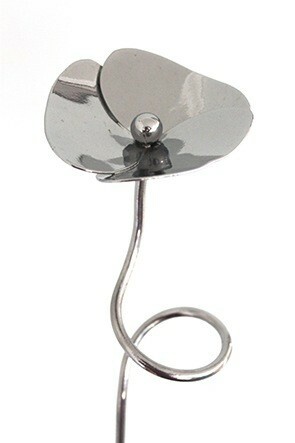 This new finish poppy has caused a lot of interest since its prototype stage. The same hand forged metal poppy as the classic red finish but now with an incredible bright mirror chrome finish that reflects light all around your garden. 115cm tall pole with a spiral loop that can support plants. The mirror effect is all over top to bottom giving it the wow factor.